Preheat oven to 325°F. 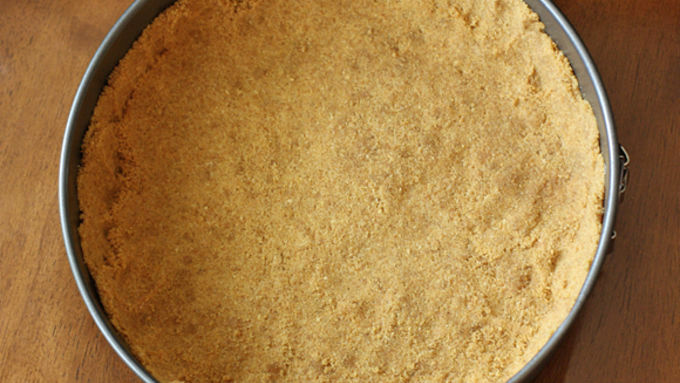 For the crust: Combine the graham cracker crust, sugar, and butter until well combined. Press into the bottom and up the sides of a 10-inch springform pan. Bake for 5-7 minutes. For the cheesecake: Beat cream cheese, sugar, and vanilla until light and fluffy. Add eggs one at a time, beating until blended after each egg. Pour into graham cracker crust. Bake for 50-55 minutes or until center is set. Let cheesecake cool. Run a knife around the outside of the cheesecake before removing the rim. Refrigerate for at least four hours or overnight if possible. Once cheesecake has cooled, prepare the whipped cream. For the whipping cream: Whip the heavy cream, sugar, and vanilla until soft peaks form. Spread over the top of the cheesecake. For the salted caramel: In a large heavy saucepan combine the sugar and water over medium heat stirring constantly. Once mixture starts boiling, DO NOT STIR AT ALL. Continue to boil mixture for 8-12 minutes or until mixture turns a golden brown. Remove from heat. The mixture will continue to brown after removed from heat. Quickly stir in butter and warmed cream, whisking until smooth. Add vanilla and sea salt and stir until combined. Pour into a container to cool. Caramel should be served at room temperature but stored in the fridge. Caramel will harden when cold. Drizzle room temperature caramel over a slice of cheesecake and sprinkle with additional sea salt if desired. Salted caramel is appearing everywhere these days – in cookies, brownies, cakes, and drinks. But what is it about the dark amber substance that is so addicting and keeps us coming back for more? I think once you've tasted the creamy, buttery caramel sprinkled with tiny savory morsels of sea salt you'll realize what all the hype is about. 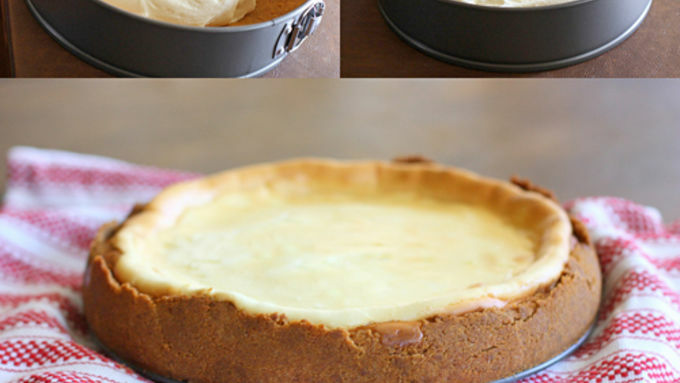 This Vanilla Cheesecake with Salted Caramel recipe is pretty amazing, if I do say so myself! 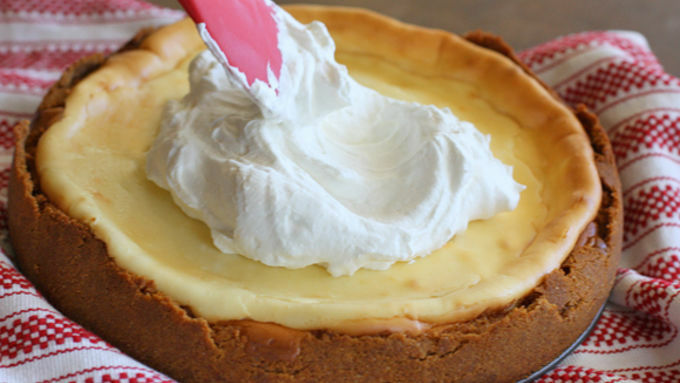 I love the light and airy taste of whipped cream in contrast to the richness of the creamy cheesecake. Sometimes cheesecakes can be flimsy and hard to serve. That's where the thick graham cracker crust comes in handy. This cheesecake is a showstopper! And don't forget a generous drizzle of the beloved salted caramel. 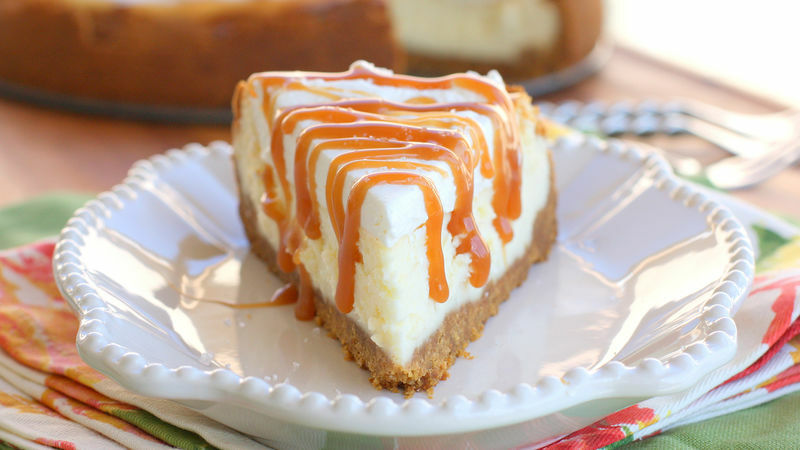 You could drizzle the whole cheesecake with the caramel or do it by the slice, which is what I prefer. If you're feeling extra adventurous, add an extra sprinkle of sea salt to bring out the flavors even more. Enjoy!